Beautiful short Irish socks, anthracite colour, 100% wool, made in Ireland with all the know-how of Donegal Socks. These are indispensable for cold winter days. The authentic Irish socks in short version, anthracite colour, 100% wool, knitted in Ireland in the workshops of Donegal Socks. Indispensable for cold winter days, this model covers half of the calf. The wool has absorbing properties that neutralise humidity and thus provide warmth in winter and freshness in summer. 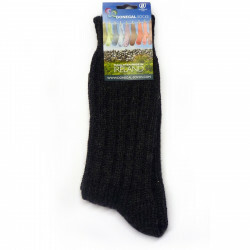 These socks are ideal for hiking, fishing or any other outdoor activity. Donegal Socks’ natural ruggedness reflects the diversity of Donegal colours and landscapes, a truly wild and breathtaking region. Donegal Socks is a family-run business of 3 generations, located in Glenties on the Irish West Coast. The wool used to make the socks is 100% Donegal wool. Deeply inspired by its beautiful surroundings, the wool is sprinkled with various colours (up to 8 colours). Glenties town has been known for centuries for its woollen sock manufacturing industry. The film “Dance in Lughnasa” featuring Meryl Streep and written by Brian Friel takes place in the town, where the Mundy sisters (who inspired the film’s story) used to earn a living by knitting socks for local factories. Today, the Breslin family has been striving for over three generations to maintain these traditional crafts and keeps on manufacturing socks for local markets and exports.